Takahiro Tajima was born in 1978 in Sendai, and started to play violin at the age of four. He graduated the Toho Gakuen Music High School and Toho Gakuen College Music Department, and studied under Takayoshi Wanami. From 2001 to 2004, Tajima was the concertmaster of the Sapporo Symphony Orchestra and then moved to Germany to study at the Hochschule für Musik Freiburg under Rainer Kussmaul. Upon graduating the Hochschule in 2006, Tajima joined Staatsorchester Rheinische Philharmonie in Koblenz as the second concertmaster, and in 2008, became the first concertmaster of the Nordwestdeutsche Philharmonie. While based in Germany, Tajima performed in Berlin, Hamburg, Amsterdam, Zurich and other cities in Europe. 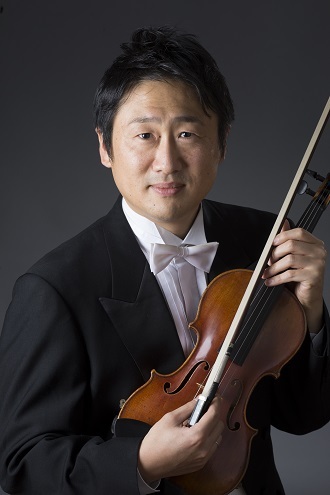 Tajima returned to Japan to become the concertmaster of the Sapporo Symphony Orchestra in September 2014. As a soloist, Tajima collaborated with the Sapporo Symphony Orchestra, the Nordwestdeutsche Philharmonie, the Symphony Orchestra of the Hungarian Radio, and many others. He appeared in Saito Kinen Orchestra, SWR Sinfonieorchester Baden-Baden und Freiburg, and acted as the concertmaster with Tokyo Ensemble (Joji Hattori, Artistic Director), and Kurpfälzisches Kammerorchester (KKO) in Mannheim. Tajima is also a passionate chamber music player, and appeared on the stage with Rainer Kussmaul, and Seiki Shinohe at the Toppan Hall for Brahms’ Clarinet Quintet (DENON label). He also performed in front of the Emperor and Empress of Japan at Toka-Gakudo in the Palace, joined the Contemporary Music Festival in Taiwan, and held recitals in Spain and Germany. With Takayoshi Wanami and Mineko Tsuchiya, he recorded Franck’s Piano Quintet (ART UNION), and has been participating in Takayoshi Wanami’s Yatsugatake Summer Course and Concerts as an assistant.